You can buy the neodymium magnets necessary for the implementation of the generator model from an online shop. All that is needed in order to find such a shop is entering "neodymium magnets" in a web-search engine, then select a shop from the resulting list. In a similar way, one can buy copper wire, or go to the nearest shop selling electronic parts, where one can also buy luminescent di-odes. The cost of these materials should not exceed 10 €. The empty milk bottle should be washed and stripped of covering containing the name and manufacturer of the drink. 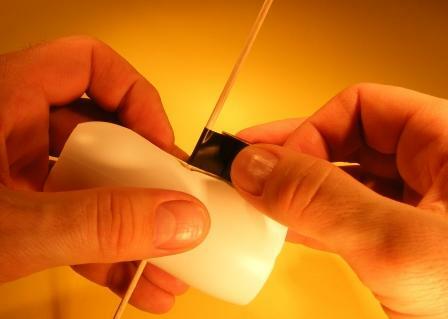 We begin by preparing the bottle to act as a generator stator. 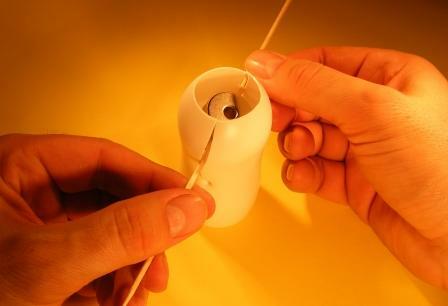 For this purpose, using a barbecue stick, we pierce the sidewall of the bottle, at the middle of its height. We have to make sure the puncture is along the diameter. Fig. 2. Piercing the sidewalls of the bottle. 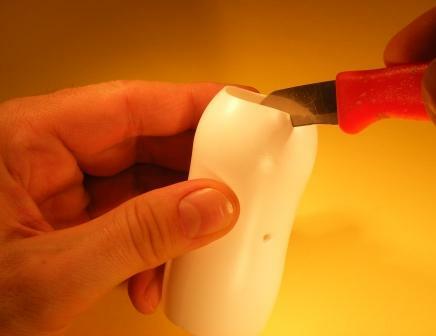 Then, using a knife, make cuts connecting the top edge of the bottle to the previously made holes. Fig. 3. Making cuts along the bottle sidewalls. Next step is to build the generator rotor : the neodymium magnets should be fastened to the barbecue stick. When we put the barbecue stick between the two magnets, it will be pressed by the forces of attraction and, in principle, this should suffice. 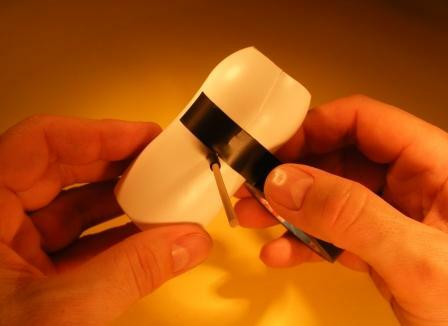 If we want the stick to be permanently placed between the magnets, the resulting gap should be filled with an adhesive, such as two-component epoxy glue (poxipol type). After the glue has dried, put the rotor in the stator. Put the rotor in the previously prepared holes through the cuts in the bottle sidewalls. 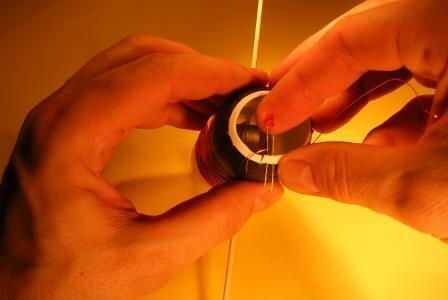 Then, using several turns of an insulating tape, secure the rotor to prevent slipping. The rotor magnets should be placed exactly in the middle of the bottle. 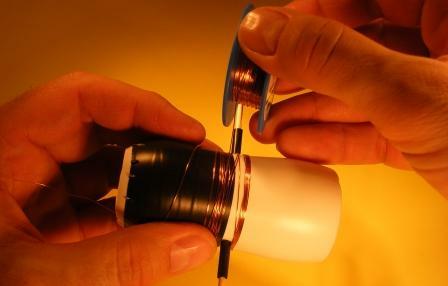 To increase the stability of the generator stator, fasten the bottle side-walls with insulating tape. Next, wind-up the stator windings. During the winding of copper wire, take care not to break the enamel layer. The ends of the windings wires should be near the top edge of the bottle. Make about 200 turns. 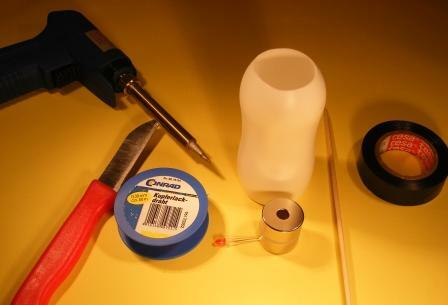 After having winded-up the windings, fasten the diode to the bottle. Through two small holes, cut the diode filaments with a sharp knife blade. Diode filaments should not come in contact with each other. 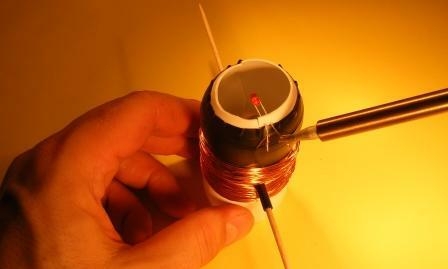 Solder diode tips to windings wires . 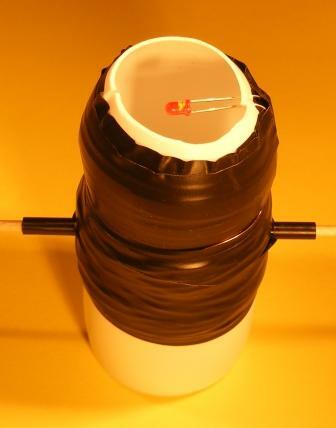 Cover the windings and soldering points using insulating tape : the simple generator model is ready for use. The pleasure of explaining why the LED, during generator operation, does not give a continuous but a flashing light should be left to the students.